What is ‘change’? Have you ever thought about it? How does it look and feel to you? Is it a meander through the funky forest of luscious life, taking in the grisly and gorgeous glory of all its sumptuous seasons? Frolicking, fresh and Spring lamb-like, followed by hot, humid and sultry; then perhaps credit crunchingly crisp and in the red, with a dash of cold and contrasting, biting, bracing blizzards thrown in just for good measure? 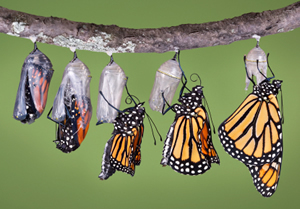 Or is it the marvellous metamorphosis of a crawling caterpillar into a beautiful butterfly? A multitude of other metaphors come to mind, too. Such as a bonny baby growing into a terrible toddler, an interested infant morphing into a pre-pubescent adolescent, a tormented teen bursting into adulthood, and a mid-life crisis degenerating into the crescendo of growing to a grand old age disgracefully. Ok, I rushed that stage of the life-cycle through a flattering yet rapid demise; perhaps there are a few more shades of nuance and subtlety in the mix before one meets one’s maker. I’d say the point was that we are like those blind men. The nature of change in our lives is our elephant. Change is a large and complex, moving phenomenon. It’s only our perceptual equipment that handicaps us in comprehending it fully. Because of that, it’s difficult to ‘know’ about it in a holistic or total way. All perspectives are inadequate in their own way and you have to consider numerous perspectives in order to really make sense of change. In attempting to define change further, we might turn to Toffler (1971), who said, ‘In the awesome complexity of the universe, even with any given society, a virtually infinite number of streams of change occur simultaneously. All “things” – from the tiniest virus to the greatest galaxy – are, in reality, not things at all, but processes. There is no static point…’ Complexity scientists will love that, especially fans of Ralph Stacey (proponent of the theory of ‘Complex Responsive Processes of Relating’). Imagine a complex infinity of interweaving streams of change, criss-crossing through an interconnected web of life, still unfolding in the course that they flow. If you think Toffler was a bit too recent for your liking though, how about stepping in your time machine and travelling back to ask Heraclitus what he thought way back in 500 BC? He said, ‘Everything flows and nothing abides; everything gives way and nothing stays fixed…… Cool things become warm, the warm grows cool; the moist dries, the parched becomes moist….It is in changing that we find repose.’ Change is a poetic constant therefore. Life keeps changing. Its ebbs and flows are one of the few things we can be sure of, apart from death and taxes. So, if there are infinite numbers of streams of change occurring simultaneously in this interconnected web of life we live, what are some of the main streams of change you might be able to identify running through your life right now? Some may be more obvious than others, while some may not have reared their head at all yet, but just be brewing beneath the surface… ready to pounce like a tiger with very sharp teeth. Just saying. But, in reflecting on your current repose, what big changes have you successfully gone through in your life in the past? Sometimes our ability to emerge still alive through these transitions can be an anchor; just the knowledge that you made it through can help. And yes, ‘this too shall pass’. Of course, some change is positive. But, just as an aside, if change were an iceberg, would you let it sink you and are you a titanic? Just to pause to reflect for a moment, I wonder what change icebergs are floating above the surface in your life right now, visible for all to see. And if there are any, I wonder what bigger changes are going on beneath the surface. Might it be possible to consider in what way these changes could already by affecting and impacting on the larger landscape of your life? Perhaps now and into the future? Whether you feel able to postulate such possibilities or not, it might interest you to think about Golembiewski’s (1976) three types of change. Firstly, he identified Alpha Level Change: a gradual, incremental, planned approach to change that cumulates over a period of time and focuses on changes to particular areas within your own life or environment (tip of the iceberg stuff – visible to others above the surface). Second came Beta Level Change: a gradual, incremental emergent approach to change that develops over a period of time to cumulative and comprehensive change in your life or environment (the deeper, under the water stuff). 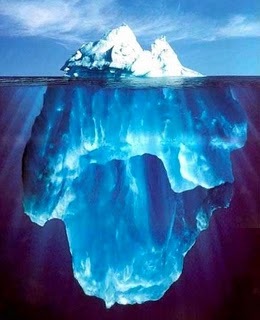 Thirdly, Golembiewski posited the thought of Gamma Level Change: a revolutionary, transformational and comprehensive attempt to create change over the whole of your life or environment; this would be a paradigm shift (the entire iceberg in its polar environment that may completely change). Reflecting on THAT (yes, re-read it and think about it, a few times maybe … go on, that last paragraph, again)… What could make deeper, bigger changes to your life? As, say, opposed to just re-arranging deckchairs on the Titanic type superficial change?